Home of the area’s finest Boarding, Doggie Daycare, Boutique, and Pet Spa. Our facility provides a safe clean and fun filled environment for you and all your pets to enjoy. The viewing glass of the large and small dog doggie daycare areas are quite entertaining with the dogs highly visible. Our goal is to provide customers and their pets with only the finest products and services. 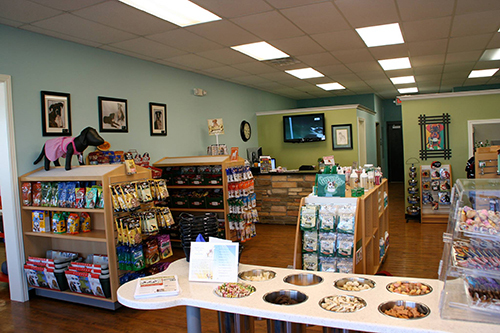 We carry a variety of different pet foods including Nutro, Blue Buffalo, Canidae, Science Diet and Royal Canin. We also have a fine selection of pet care products, gourmet doggie treats, toys, bedding and many beautiful and unique boutique items. Come in and let our helpful staff find just what you need for you and your pet. Premium service comes standard at The Savvy Dog. Spacious accommodations, premium pet food fresh water and quality beds. Daily housekeeping with health monitoring and record keeping. Your pet will get a goodnight tuck in with a snack and a “scratch behind the ears”. You may bring your own food or toy if your pet has a favorite.